The latest version of the Google Play Music app for iOS brings a new icon, a timer feature in the settings and an updated search bar that helps you find music faster. 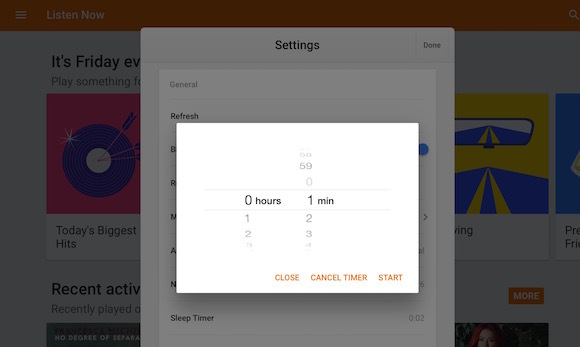 There's a new "sleep timer" feature in the settings, which stops the music when timer ends. For example, you can set the timer and play your favorite tunes for falling asleep. A similar feature is available in the built-in Clock app for iOS and it works for any music app. The new app icon is less recognizable than the old one and it's also asymmetric. Apparently, Google's music service will add support for podcasts next Monday. Like that they're adding podcast functionality. Still think you should be able to customize what shows up under Listen Now (both in the app and on the desktop version). Does anybody really use those Songza playlists? Sorry, but that new icon is f'ugly. Agree with Arecad....I have a separate app just to do this. I don't understand why it would be added to IOS first, when it should be released simultaneously (if they ever add it). what you want to UK mines the things I top comment 1809 a crime a tactical Alphamanix turn K number of just Island me so yeah I next rescue underhand overhand girls call summit comes up forms home in a set on a bench peace with the Arabs favorite website itself and . Great joy to use those ipad case. can u tell me how to create a new accont on Google Play Store.